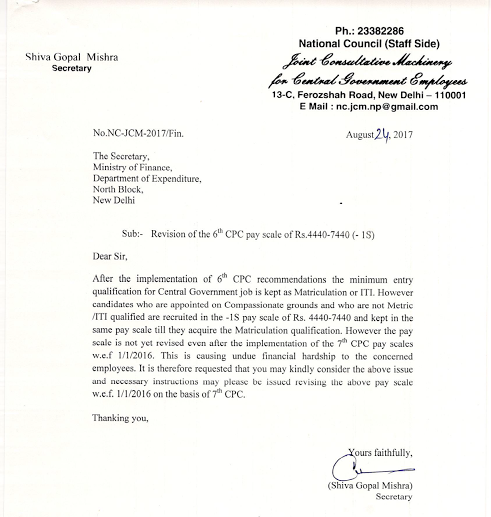 Shiva Gopal Mishra, Secretary, National Council (Staff Side) Joint Consultative Machinery for Central Government Employees on August 24, 2017, requests to Ministry of Finance that kindly consider the issue of pay revision of non-matric employees appointed on compassionate ground in 6th CPC pay scale -1S(4440-7440) w.e.f. 1/1/2016 on the basis of 7th CPC. Alter the implementation of 6th CPC recommendations the minimum entry qualification for Central Government job is kept as Matriculation or ITI. However candidates who are not Matric/ITI qualified are recruited in the -1S pay scale of Rs. 4440-7440 and kept in the same pay scale till they acquire tho,- Matriculation qualification However the pay scale is not yet revised even after the implementation of the 7th CFC pay scales w.e.f. 1/1/2016. This is causing undue financial hardship to the concerned employees. It is therefore requested that you may kindly consider the above issue and necessary instructions may please be issued revising the above pay scale w.e.f. 1/1/2016 on the basis of 7th CPC. JCM writes to MoF for consider the issue of pay revision of non-matric employees appointed on compassionate ground in 6th CPC pay scale -1S(4440-7440) w.e.f. 1/1/2016 on the basis of 7th CPC.